June 2014 | What's the Point? This review for 102 Ways to Save Money For and At Walt Disney World by Lou Mongello is part of a Magical Blogorail sponsored campaign. Copies of the book were received free of charge for a review. Opinions are those of the reviewer and do not represent those of the author. Your opinion may vary. 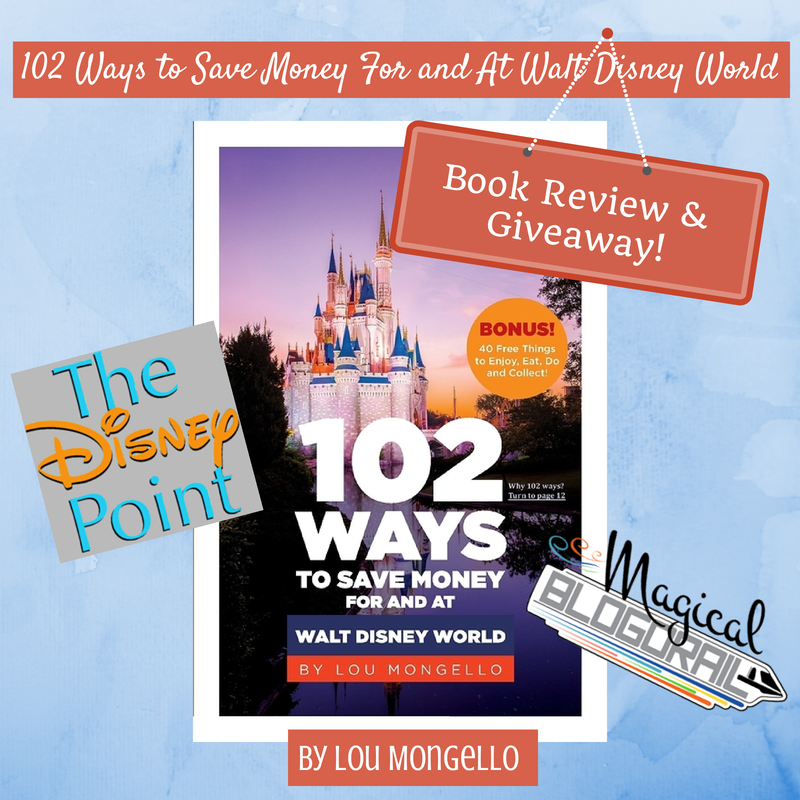 I am honored to have the opportunity today to review "102 Ways to Save Money For and At Walt Disney World" by Lou Mongello. On a personal note, I first "discovered" Lou Mongello back in the day when I used to download Walt Disney World ride audio from Napster. I had no idea a Disney fan community actually existed until I purchased Lou's awesome Walt Disney World trivia books one trip in Virgin Megastore at Downtown Disney. Since then, I've been a loyal listener of WDW Radio, a podcast that Lou has been the host and producer of since early 2005. I remember this time well, because I had just finished my fall 2004 Walt Disney World College Program, and I was hungry for any and all WDW info! About "102 Ways to Save Money For and At Walt Disney World"
First of all, as a former cast member, I had to chuckle when I saw the title of the book. While most informational books have 101 ways, I immediately knew the reason why picked 102. Any cast member will tell you, when an attraction breaks down we say it's "101." When it is back up and running, it's "102." I was only a few pages in and I already LOVED the book! Beside that little bit of Disney-geekdom, 102 Ways is a terrific way to prepare for a Walt Disney World vacation. As most people know (Disney fan or not) Walt Disney World can be extraordinarily expensive and the price tag can seem insurmountable. I have found that even with a Disney Vacation Club membership that is paid off, I have a difficult time coming up with money for even just the flight and park tickets. However, by following Lou's simple but genius tips, you can save money for your trip and even during your trip. What I liked most about the book is that it's broken down into easy-to-comprehend and read sections. Need resort tips? They are all together. Already paid off your trip but need some free things to keep you occupied? There's a section for that. Lou's tips are foolproof and all legitimate. You don't have to worry about getting scammed on fake tickets on 192! As you probably know, I like to eat. 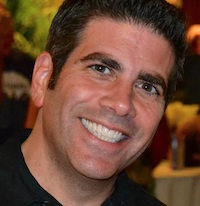 As a loyal listener of WDW Radio, I am confident that Lou would tell you that he likes to eat too. But sometimes after a big breakfast and walking around in the lovely Florida heat and humidity, I am not in the mood for a massive lunch. One of Lou's best tips: You can save nearly $8 per meal by skipping the sides! I'm sure you're aware of the combo platters in the quick service restaurant. Just because it's packaged that way for your ease doesn't mean that you need to buy it that way. I really never thought of that, and that's what makes it such a great tip! Did you know that if you book a vacation package with Disney you can order free, personalized maps? I did. I've ordered them pretty much on every trip I've been on because they are really beautiful. One of Lou's tips was to have the characters autograph the maps instead of spending money on a book. I just love this tip because it must make such a great keepsake and decorative piece at the end of your vacation. Free water. I know I've mentioned it before on this blog, but it's worth mentioning again. Do not dehydrate yourself because bottled water is expensive. Any quick service restaurant will give you a cup of ice water if you request it, for free. 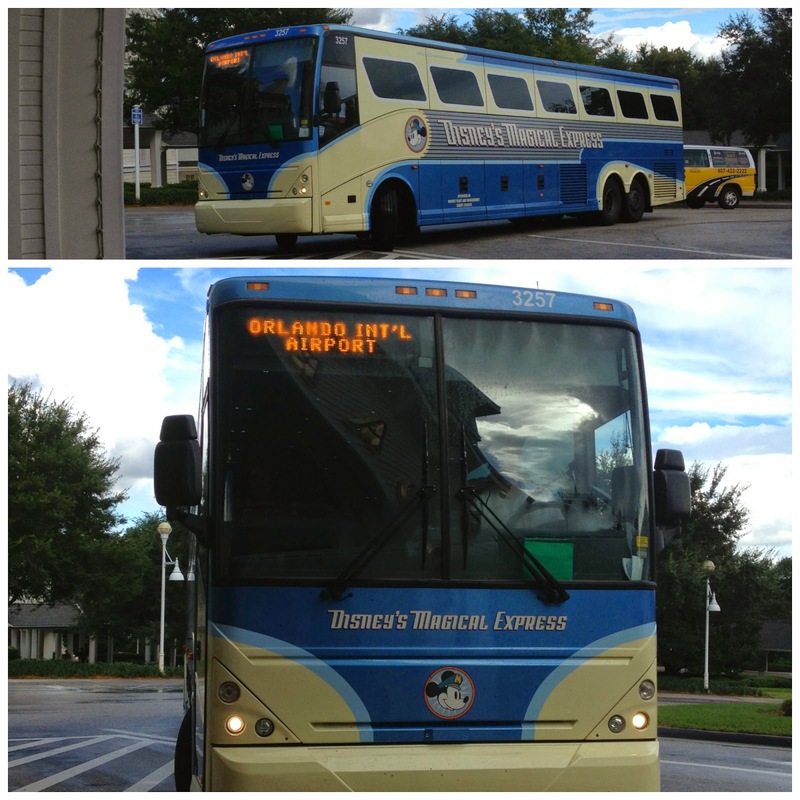 How Can You Save on a Walt Disney World Vacation? 1. Open up your wallet. 2. 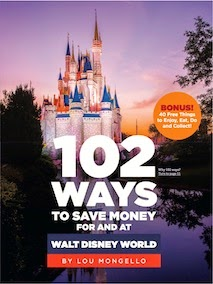 Purchase Lou Mongello's "102 Ways to Save Money For and At Walt Disney World." 3. Read it, and follow his advice. Unsure about the book? I highly recommend you take a listen to the WDW Radio show podcast or participate in one of Lou's monthly meets. I know you'll be a dedicated as I am, especially after you save a boatload of money on your next vacation! This review of 102 Ways to Save Money For and At Walt Disney World by Lou Mongello is part of a Magical Blogorail sponsored campaign. It's easy to get lost in the hustle and bustle of the Magic Kingdom. Often, even if you start your day at the crack of dawn, time escapes you and before you know it, it's time for the fireworks and the Main Street Electrical Parade. However, as we are approaching the Fourth of July, I urge all Magic Kingdom guests to stop what they are doing at 4:45 and walk to the front of the park. Why? 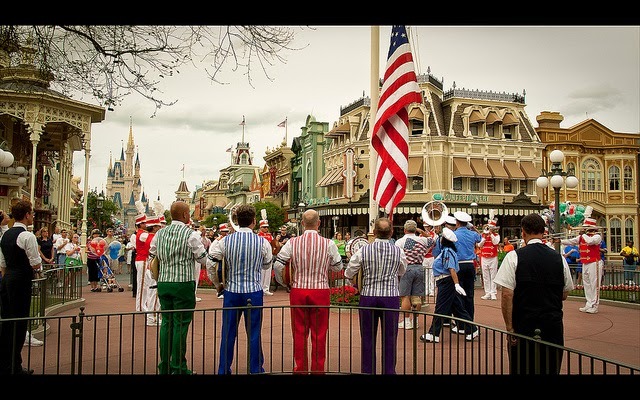 So you will have the opportunity to witness the most important part of a Magic Kingdom day that virtually nobody knows about - the Magic Kingdom Flag Retreat Ceremony. Every single day at 5pm, rain or shine, Main Street USA Cast Members, march out in unison, accompanied by the marching band, Dapper Dans and members of Disney security team. They take take down the American flag in a very careful and precise way. 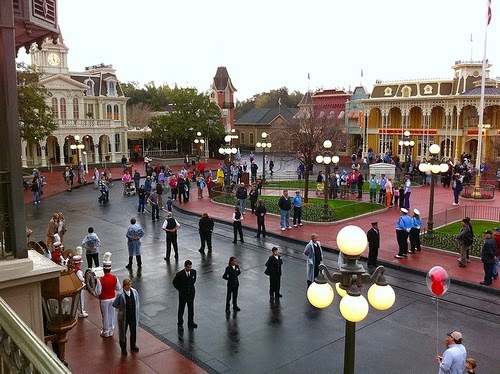 It's a time of day that the entrance of Main Street isn't crowded at all. Some folks are leaving and very few are coming in for a park hop. But Disney treats this ceremony with the utmost respect. For me, the best part of the ceremony is the fact that they choose a United States veteran every single day to participate in the ceremony. This veteran salutes the flag as it is retreating, and after the security team folds it respectfully the veteran is presented with the flag. This is by no means a flashy ceremony. There's no characters running around and little fan fare. However, I think that this simplicity is what makes it beautiful, touching and perfect. Next month, take a break from the hustle and bustle and go watch the Flag Retreat Ceremony. You won't be disappointed!